In Bandung there is one place culinary that is the center off all hawker style food and it is also well known as fun hangout place in Bandung it is called Paskal Food Market. Paskal itself has acronym Pasir Kaliki which is a street name in Bandung. Paskal Food Market itself has now become one of Bandung’s popular culinary places. The evidence speak no more, every day this place is crowded of visitors hungry for food. With the open concept, Paskal is very interesting for hangout. Not only that, it’s neat and instagramable spatial make Paskal Market is optimal for camera aimed. At night Paskal Food Market more interesting to visit because there is a romantic impression that is presented from incandescent lamps and ornaments torch as illumination. Although the concept of outdoor, on this food market, you will not find street singers, street vendors or beggars. These kind of environment will make your culinary adventure more comfortable. The convenience on Paskal also appears from live music that is presented on certain days. Live music will be held on stage in the middle of the fountain pool. From the delightful of this live music, we can be more relax and enjoying the food with more fun. Not only for the live music, but also on the fountain pool there is a statue of a man holding a ring so you can throw a coin of luck. Because of this belief in the power of luck, that’s the part of the pool here called “Fountain of Hope”. In Paskal Food Market itself there are more than 50 booths provide various food menu such as Indonesian food, Chinese food, Japanese food and western food. There are no less than 1001 menus we can enjoy at this market. As for the food stands, there is Ubi Balls Stand selling sweet potato ball, and also a famous satay stall in Dago Sate Maulana Yusuf. For the price, of the menus in Paskal is fairly affordable with 10% tax. The opening hours of Paskal Food Market are from 11:00 AM to 11:30 PM for Monday-Friday. Meanwhile for the weekend (Saturday and Mingu), Paskal Food Market is open from 11:00 AM until 00:30 AM. The most crowded hours is on when people back from work. So it’s from 05:00 PM until night time. Not just the local visitors, because this Food Market is so popular, it’s makes the tourists come here too. We can find Paskal Market Food on Jalan Pasir Kaliki Number 25-27, Bandung or precisely in Paskal Hypersquare. To get here you can use public transport or private vehicle. But you who want to be comfortable should choose a private vehicle. If you can not bring a personal vehicle because of the remote location then the solution is you can use a car rental in Bandung. With Bandung car rental you are more flexible to determine the route to the food market. When free to determine the path of travel, it will be able to avoid some traffic jam in Bandung. With Bandung car rental you also no longer need to lose a lot of time to wait for public transportation. Moreover, public transportation is often ngetem will certainly make your time wasted. With Bandung car rental, you can also be more comfortable in the car. This is because the state of the car rental is fairly well preserved. Well if you are looking for a car rental in Bandung can make Dirgantara Car Rental as a reference. This is because Dirgantara Car Rental has 30+ years experience in serving consumers. With professional service as Dirgantara Car Rental then you can enjoy culinary tour of Bandung in Paskal Food Market with fun. Traveling to a hot spring will always bring its own long lasting impression. This is because we can relax and also pamper yourself until the body feels relaxed, healthy and stress free. Especially when the baths are located in a place on the plateau that has a cool air. Well one of the hot springs in Bandung that we can go to pamper ourself is Cimanggu Hot Spring. With an area of ​​154 hectares, this hot spring will make us satisfied doing exploration activities. Supported by a green panorama of the existing trees, create a beautiful and natural atmosphere will be immediately felt when in this bathhouse. This place is located in the Village Rancabali. Cimanggu Hot Spring Tourism located at an altitude of 1100 meters above sea level to make the air around cool even be calculated cold at certain times. Not just cool or cold, but the air in this spring is also fresh because it is free from pollution. From some of the mentioned dish you will already feel relaxed while in this spot. Not to mention when you plunge yourself to bathe in the pool bath. Bathing in the pool of Cimanggu Hot Spring bath will make your body can be more relaxed, relaxed and pampered. The water from this hot spring is originated from Mount Patuha. With water temperatures ranging from 40-60 degrees Celsiusm you will feel instantly warm when you throw yourself and soak in the pool. Swimming baths that exist in Cimanggu Hot Spring itself are come with three different sizes. Three swimming baths are provided for public visitors. But if you want to enjoy the privacy pool (VIP pool) which can be rented at a rate of Rp 5,000, – per 15 minutes. With the existing sulfur in the water in the bathing pool can help make skin-related diseases such as ringworm and panu healed faster. For you who have problems with rheumatism will also be overcome with a routine soak in Cimanggu Hot Spring. And one more thing that you will definitely get from Wisata Hot Spring Bathing Cimanggu is your body that will feel relaxed. To enter and enjoy Cimanggu Hot Spring you have to prepare fund of Rp 16.000 / person on weekdays (weekday) and Rp 23.500 / person on holiday or weekend. The opening hours is 24 hours. This wonderful place is located in Lebakmuncang, Ciwidey, Patengan, Rancabali, Bandung, West Java. To go to this hot Spring, you can use private vehicle or public transportation. But to make your holiday feels more comfortable then you have to choose a private vehicle. But if you can not bring a personal vehicle, you can use a car rental car Bandung. By rent or rental this Bandung car you will feel the comfort because you no longer need to wait for buses or public transportation to go. Travel route can be freely you specify to avoid jams. Well one reference Bandung car rental is Dirgantara Car Rental. With experience for 30 years of professionalism Dirgantara Car Rental as a car rental place in Bandung no doubt. So by using a rental car Dirgantara Car Rental will make your holiday in Cimanggu Hot Spring Tour more exciting and fun. For those of you who want to enjoy a romantic vacation with your partner, Barusen Hills in South Bandung regency will be the right place. 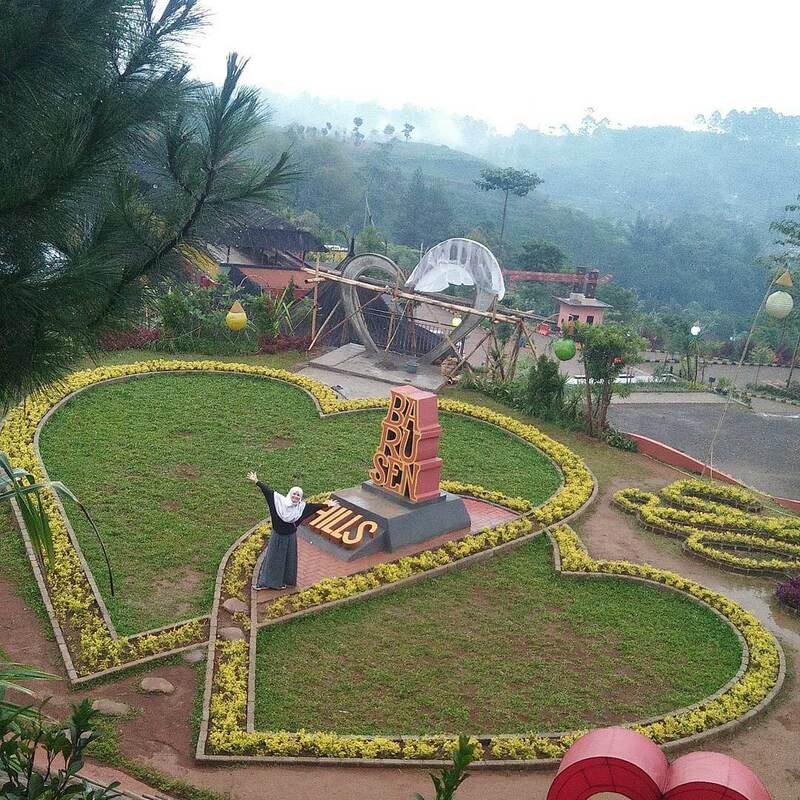 Barusen Hills is a tourist attraction that is now being viral in Bandung. Especially among young people. As we know that the trend of taking instagram pictures in a beautiful place is now a common thing. Well for you the lovers of photography then Barusen Hills is also going to be a very interesting place to go. Being in this Barusel Hills we will be treated to many beautiful scenery. It has been set in such a way to create a place that spoil the eye. It is located in the area Gambung, Ciwidey, South Bandung regency. Which makes Barusen Hills have a nice cool breeze. Visitors who come will be more at ease linger in Barusen Hills. There are many interesting photo spots that we can find in this Barusen Hills. A few spot photos here is perfect for couples who are in love. Some spot of love-themed photos that exist in Barusen Hills is a post that acts of bamboo shaped love. We can also see the scenery Barusen Hills widely from the top height. There are other photographed areas or spots in the right Barusen Hills. To capture your love story like love gardens, love sign in the pool and also the flower garden. Flower garden in Barusen Hills itself presents a variety of beautiful colors. This place is frequently used as the location of pre-wedding photos. This place is also called Barusen Ciwidey Hills. You can also find an interesting spot of photography that is typical of a typical Dutch windmill. Do not forget also spot photos Barusen Lake or Lake Barusen. You can ride a boat that will produce cool and instagramable photos. Traveling to Barusen Hills alone will not make you worried about the amenities. Because the supporting facilities here are fairly complete. Not only public facilities, in tourist attractions such as parking areas, rest areas, mosques and toilets, but here you can also find other facilities such as canteen, playground and water park. With the playground and water park then you who come with children will also be able to enjoy the same tour. Water park in Barusen Hills itself is highly qualified for a place of exclamation because there are many rides games that can be obtained. Some of the rides of the game in the water park are water slides, spilled bucket and so forth. One other facility that you can also enjoy in Barusen Hills is a villa for overnight stays. To enjoy this Barusen Hills tour you only need to pay entrance fee of Rp 20.000 / person on weekdays. While on the weekend (weekend) entrance fee rose to Rp 25.000 / person. This ticket alone includes a ticket to enjoy the swimming pool. To go to Barusen Hills you can come every day from 08.00 AM to 05.00 PM. You can visit Barusen Hills in the area Gambung, District Ciwidey, South Bandung regency. Although easy access and there is also a public vehicle that goes to Barusen Hills, but will be more comfortable when you use a personal vehicle. With your private vehicle will indeed avoid the congestion because the route of the road. In addition to that, the advantage of using a private vehicle that we become more comfortable in the car because it does not coincide with passengers. But what if you find it difficult to bring a car because of a place away from Barusen Hills. Do not worry, there is a Bandung car rental that could be a solution. With Bandung car rental you will feel the sensation of bringing your own car. Well one reference where Bandung car rental that you can choose is Dirgantara Car Rental. With 30 years of experience then Dirgantara Car Rental will be a qualified place to make your holiday activities more exciting and fun. Located in the east of the Lembang area, precisely in Djuanda Forest Park area, you can go to a tourist destination called Curug Maribaya. This Maribaya waterfall is an exquisite waterfall exotic with the surrounding environment that is still sustainable. The preservation of the Maribaya Curug region is visible from the shady trees and the cool air breeze. Although Curug Maribaya is most popular with hot water spring but Curug, the Maribaya Waterfall also should be taken as consideration. This is because Curug Maribaya has been renovated. So it becomes a better place of recreation and tourism. Maribaya waterfall itself has a height of 15 meters. The water comes from two streams of the River Cikawari and Cigulung River. To find a clear Maribaya Waterfall then you must come here during the dry season. When the water is clear then you here can enjoy the scenery with full of charm. But if you come in the rainy season, the water in this Maribaya waterfall will be brownish. Besides Maribaya Waterfall in this tourist area there are several other small waterfall. Those are Curug Cikolelang, Curug Cigulung and Curug Cikawari. These three small waterfall Curug Cikawari have shallow and safe water depth. They are favorite place of the tourists too. Besides enjoying the charm of Curug Maribaya, you can also be relaxed. The air is cool and fresh. Enjoying the culinary here will make the holiday activities will be more memorable. When heading to the location Curug Maribaya you will be treated to something interesting. There are the Dutch cave and Japanese cave. They are historical places which have its own value. For those of you who like fishing, Curug Maribaya has a fishong pond. its called Telaga Giri Pond. Want to take a bath in the hot water bath? Just come to Maribaya Natural Hot Spring Resort. It is still one location with Curug Maribaya. If you have a lot of time then visit Curug Omas also. From the charm that is presented then being in Curug Maribaya makes anyone will want to capture the scenery with the camera. Not only the background of the waterfall but here we can also take pictures with interesting backgrounds around the waterfall like Sky Bridge Tapak Halimun which is a bridge located on the left of Maribaya tourist area. Holiday to Curug Maribaya will also make us satisfied. This is because here has provided various facilities. Some supporting facilities Curug Maribaya tour of the area of ​​extensive perkir, musholla, cafe, eating places, toilets, Bale Pinton Ampitheatre, mini zoo, parks and so forth. To get into this Maribaya Curug tour you only need to spend Rp 35.000 / person. And to get to Curug Maribaya you have to go to Kampung Cikondang, Lamajang Village, Pangalengan, Lembang, West Bandung, West Java. In order to get to the address of course you need a vehicle or means of transportation. Transport to Curug Maribaya itself has many and have many choices. You just determine and suit it to the needs and budget you have. But if you want to enjoy a comfortable ride then the option of private vehicles is something appropriate. This is because with your personal vehicle will be spared with wasteful time like when taking public transportation. When riding public transport you should be prepared with the amount of time wasted due to waiting time to depart, the route is far away and the habit ngetem from the drivers. Because many tourists are reluctant to bring personal vehicles from a distance. Well for a solution for those who can not bring a personal vehicle to Bandung Dirgantara Car Rental will be the best solution for you. With the professionalism and experience of Dirgantara Car Rental will make your holiday in Curug Maribaya will be more fun.